Ya'll keep asking about my garden. I appreciate your concern. I was also very curious about how my garden was growing. Amazingly, we returned from our three week absence to find our garden already producing harvest. I am not amazed because I expected my neighbor to kill everything. To the contrary, I think she did a lovely job of tending my yard, which suddenly became high maintenance as a result of our new garden. More, I am amazed simply because I have never had a successful garden. The wonder of putting a seed in the ground and watching it grow to millions of times its size, bloom, and produce fruit is nothing short of a miracle to watch. When we came home we had a couple dozen ripe grape tomatoes. If they produce nothing more this season, we have already had our most successful gardening adventure ever. And the good news is, we have dozens more still ripening on the plant, as well as lots of blooms foretelling continued harvest into next month. 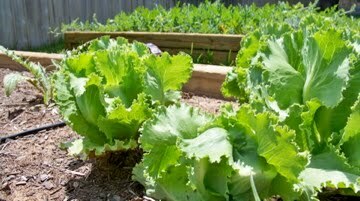 My lettuces finally got past the caterpillar stage, thanks to the birdhouses in my yard. Once the chickadees and sparrows figured out there were tasty little morsels hiding in the garden boxes, they began combing the plants every day in search of more insects. I have had no bug problems since. We ate our first head of lettuce last night. It's a little more chewy than romaine, with a slightly bitter taste. But our theory is that the taste means there are more good vitamins in each bite. The artichokes are starting to look more thistley, the carrot tops are looking more carroty. Sadly, the peas are just burned to death from the heat, but Rooster's pair of lima bean plants from preschool really enjoy their spot at the end of the row of peas. We did harvest half a dozen peas, with a few more coming. 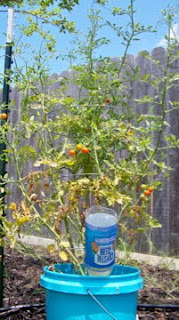 But I think they will do better when I start the fall crop in another six weeks or so. I love that we get two growing seasons here. Rooster's pumpkin plant is also taking off. I'm so curious to see what happens with that plant. Maybe we'll get some Jack-O-Lanterns out of it! Or maybe some pie, or maybe even a dumpkin. What's that? It's a full meal cooked inside the pumpkin, composed of ground beef, onions, cream soup, rice, and some other casseroley things. We don't eat casserole in this house, but occasionally I can mix up something you might call a casserole, creatively present it under a different name, and everyone loves it. Dumpkin is one of those, so named because I just dump a bunch of stuff inside a hollowed out pumpkin and bake it. And because it makes everyone laugh, followed by eating heaping platefuls of it. I make it once a year in October. Of all my garden, the watermelons have grown the most. They are practically viral in their robustness, nearly taking over their box. I hope the pumpkins are strong enough to fight back at least enough to produce three or four gourds for me. But if not, at least we will have watermelon, as many as will fit in that little box. I'm starting to think the back flower bed would indeed have been a better place for them, because they really do take up a lot of space. All in all, I'm very pleased with the success. One little jalapeno so far, which contributed to some mighty fine guacamole on Father's Day. Several more flowers indicate we will have more peppers in July. I think I might really enjoy this gardening thing, just as I suspected. Girl, I am loving this post!! You are experiencing such wonderful garden adventures! Keep it up! We have a garden, too! Isn't it awesome? 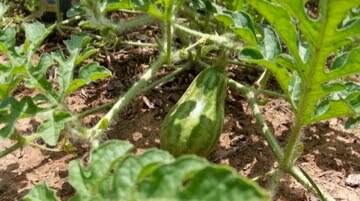 We had watermelons last year - and yes - they took up the whole garden!!! I was shocked - especially since watermelons don't grow so well in the north! I'm sure yours will be tasty! 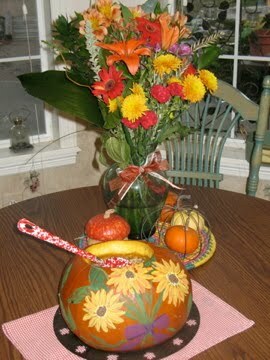 And that casseroly thing in the hollowed out pumpkin!?! How neat!! I might have to try it! Post your recipe in the fall - that would be a fun blog post! Thanks for stopping by today - it encouraged me! There is sooo much to learn in gardening. Quite interesting and so satisfying when you get to enjoy the harvest. We are eating well!! 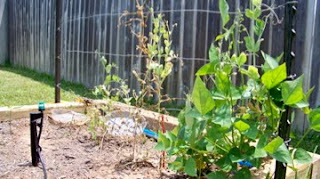 Blessings - so happy your garden survived and thrived through your absence. I really love these kind of garden adventures. It was nice going through your blog.